People described it as an avalanche or a tsunami of dust. 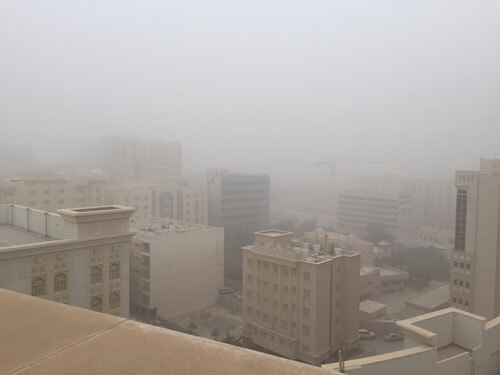 Long term residents of Qatar said it as the worst sand storm they can ever remember. One minute it was clear, but seconds later Doha was hit by high winds carrying tons of fine dust. People described the noise of the wind rattling windows, of dust seeping beneath doors and through any gap it could find. In the morning before dawn, the view from our windows was orange with visibility down to 15 metres at most. The photo above was taken around 6:30am when visibility began to improve. The ledges outside our flat were beige. The basement car park and all the cars looked like it had snowed in the night leaving a thick layer of light brown powdered snow behind. Our part of the building is well sheltered by the larger buildings all around. Our windows were fairly airtight, so the flat remains dust-free. We actually slept through the whole episode, having gone to bed before the dust arrived, and so entirely missed the storm of the century.